Once visited by the late literary master Naoya Shiga. 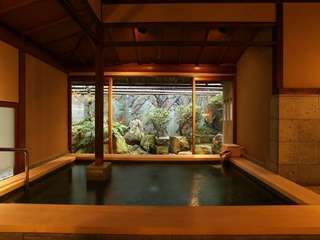 Yukari Inn's wooden design is purely Japanese and features a Japanese garden. This long standing inn inspired the master literary Naoya Shiga's beloved novel 'Kinosaki ni te'(At Cape Kinosaki). 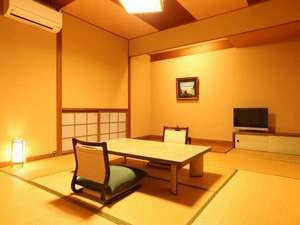 Traces of the early 1900's are still found in Yukari Inn's traditional Japanese design. Let time slip by unnoticed while enjoying yourself and the view of the changing seasons in our elegant Japanese garden, in the middle of Kinosaki. We are a traditional inn that wishes to carry on the traditions of the honored past. We may not be fully equipped with every modern day convenience, but perhaps that is what makes us fortunate enough to provide a quiet and relaxing place for our guests to rest. 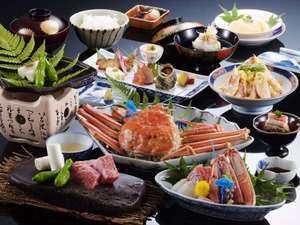 Recommended for guests who want to enjoy both crab and Tajima Beef. 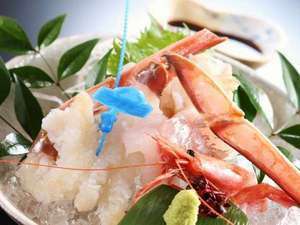 We serve a whole crab which is with guaranteed tag per person, 3/4 of which will be fresh crab caught at nearby local port (Tsuiyama or Shibayama). In addition, you can enjoy Tajima beef steak which is famous as seedstock cattle in the breeding of Kobe beef and Matsusaka beef'. -Dinner Menu- Assorted appetizer, locally caught crab sashimi (1/4) and fish sashimi, boiled crab (half crab) with vinegar dip, Tajima beef steak, boiled crab, soup, Japanese pickles, dessert * Boiled crab at photo above is for 2 servings -About children's food- * Children under 6 are not accepted to stay in our inn. Thank you for your understanding. Children’ fee between 7 to 12 are as follow. We charge you 70% of adults’ fee for children Kaiseki dinner. 50% of adults’ fee with western-style kid’s meal (If you like to order children’s meal, please let us know by filling in "Request form". Both dinner and breakfast will be served at the newly renovated dining room. * The final arrival for dinner is 18:30. * Please note that it may not be possible to serve dinner, if you check in is after 18:30. * There is no elevator (lift) in the inn. If you would like a room on the first floor because of physical reasons, please contact us. *The mentioned cancellations fees are for groups of up to 14 people.